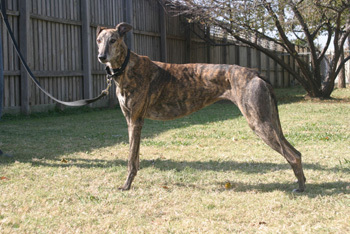 Carmen is a beautiful 7-year-old dark brindle female born July 2001. Carmen's litter registration number is very faint, so her identity is not known – although her right ear is 71A. When Carmen arrived, she tested heartworm positive; however her treatment was successful, and she is now heartworm negative! 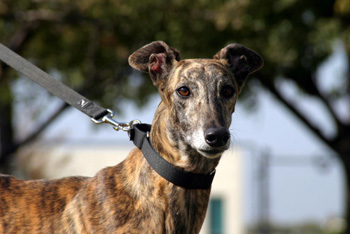 Carmen has a bright, clear gaze and "fortune cookie" ears. Carmen's cat test: Carmen came to visit and to meet the big cat, Domino, today. She moved in for a couple of sniffs, first with muzzle, then without. She was indeed interested when he was walking across the floor, but once he was settled in a chair or eating, she looked away and seemed more interested in other sights and smells around the house. For now, Carmen passes for cat trainability, but I recommend close supervision for a while because this was a fairly short cat test. From the afternoon she arrived, she has acted as if she had been here for years. Carmen has had no accidents in the house and sleeps all night without having to go outside. Until recently she didn't make a sound – she barked outside to get the other dogs to play with her. She also doesn't want anyone to share her treats. Carmen is eating a little more now than the other dogs so we can put some needed weight on her. She has a slight, slender build but needs to add a pound or two. (She loves yogurt and treats of all varieties.) Her ears give her the cutest expression – they fold forward – and make her hard to resist. She is an excellent leash dog – walking right by my side without much interest in sniffing. Carmen is a pro at going up and down stairs. There is no need for Carmen to be crated and she prefers not to be crated. Carmen blossoms in the company of other dogs and loves the companionship. She would prefer not to be a single pet. Although not a natural retriever, she is learning. 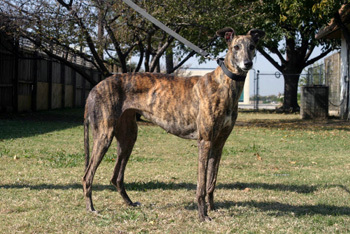 She is very playful in the yard and would love to have a space to play and run in her new home. She suns herself, scratches her back in the grass, and flops from side to side. There have been no problems with counter surfing. She did try to learn to read a paperback book (with her teeth) but that temptation has been removed. And what an affectionate girl Carmen is. She loves being rubbed everywhere. I'm sure the longer she is here the more her personality will shine. Take a look at this sweet girl and consider giving her a forever home with you.